Halloween in North Carolina�s Outer Banks becomes seriously tricky when librarian Lucy Richardson stumbles across something extra unusual in the rare books section: a dead body. Wealthy businessman Jay Ruddle is considering donating his extensive collection of North Carolina historical documents to the Bodie Island Lighthouse Library, but the competition for the collection is fierce. Unfortunately, while the library is hosting a lecture on ghostly legends, Jay becomes one of the dearly departed in the rare books section. Now, it�s up to Lucy Richardson and her fellow librarians to bone up on their detective skills and discover who is responsible for this wicked Halloween homicide. Meanwhile, very strange things are happening at the library�haunted horses are materializing in the marsh, the lights seem to have an eerie life of their own, and the tiny crew of a model ship appears to move around when no one is watching. Is Lucy at her wit�s end? Or can it be that the Bodie Island Lighthouse really is haunted? 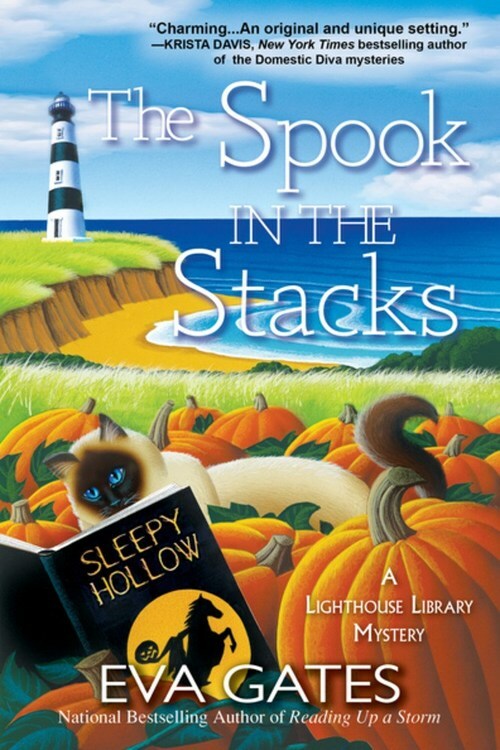 With The Legend of Sleepy Hollow on everyone�s minds and ghoulish gossip on everyone�s lips, Lucy will need to separate the clues from the boos if she wants to crack this case without losing her head in The Spook in the Stacks, the delightful fourth in national bestseller Eva Gates� Lighthouse Library mysteries.